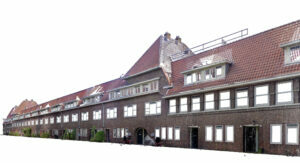 Dutch engineering company Aveco de Bondt has created a unique workflow to improve the engineering of energy efficiency and structural safety of social housing in the Netherlands. Using state of the art 3D laser scanners Aveco de Bondt can capture every detail of an individual house or residential complex. The vast datasets – point clouds – collected are then processed, using Pointfuse software, into usable and accessible 3D models for onward use in the design, engineering and construction process. Working on behalf of social housing providers across the Netherlands Aveco de Bondt is helping to regenerate properties in terms of sustainability; by making them energy neutral or more energy economical, and, structural safety; for buildings at risk of earthquakes. Using laser scanning hardware from Zoller+Fröhlich, Aveco de Bondt captures every external detail of single occupancy buildings or more complex multi-residential structures in a fraction of the time compared to traditional survey techniques. The vast point clouds collected – often comprising millions if not billions of individual measurements – are then processed, using Pointfuse, into segmented mesh models complete with selectable surfaces, for use in the onward workflow. Aveco de Bondt is a Dutch engineering company that specializes in combining technical expertise with practical project experience. Employing over 300 specialist staff Aveco de Bondt works alongside local and regional government, utility providers, construction companies, developers and investors to provide research, consultancy and engineering support. Pointfuse is a powerful modelling engine that delivers an automatic, precise and flexible way of converting the vast point cloud datasets generated by laser scanners or photogrammetry into segmented mesh models. Pointfuse uses advanced statistical techniques to create 3D models where individual surfaces can be selected and classified as new layers in the Pointfuse environment and exported to IFC and FBX for manipulation in any industry-standard CAD system. These selectable surfaces bring a catalyst to the workflow of design and engineering projects, offering efficiencies that have not been possible when working with point clouds or traditional mesh models. The software’s versatility means it is currently used to provide efficiencies in a broad range of workflows within the AEC industry. The high fidelity models provide an accurate base from which designs can be made, while also providing as-built information into BIM processes, allowing clash detection analysis and design reviews to be easily performed. High quality texturing also makes them a great deliverable, allowing customers and stakeholders to visualise their assets with real world context, aiding with decision making and engagement. Click below to view the full article, or email mike.deacon@pointfuse.com for more information. How can Pointfuse help you?